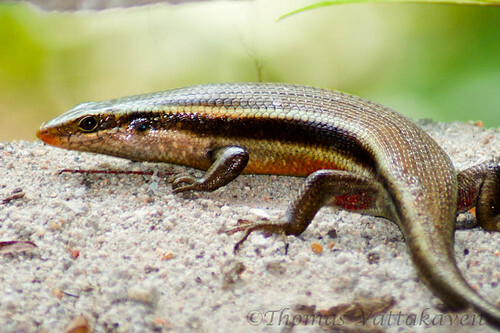 Having posted about the Garden Lizard earlier, I thought it was time to get some images of another common reptile that frequents our neighbourhood – the Dussumeir’s skinks. Skinks are a group of reptiles which resemble the snakes more than lizards. They are the most diverse group of lizards. 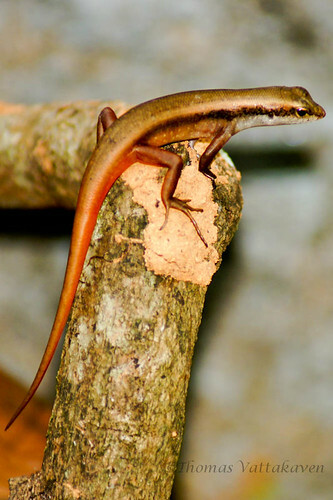 Although most skinks, like the one featured here, have two pairs of limbs, some species have either reduced limbs, reduced hind limbs or no limbs at all. 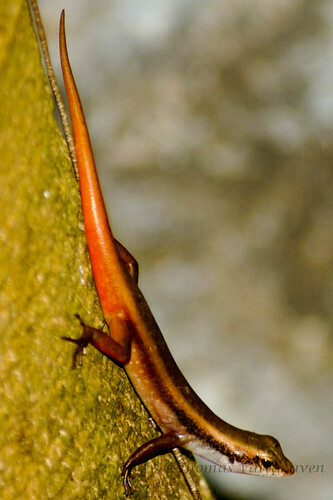 When a skink is attacked, it may shed its tail, which continues to twitch without the body. This distracts the predator while the skink makes its escape. The tail is regenerated later. 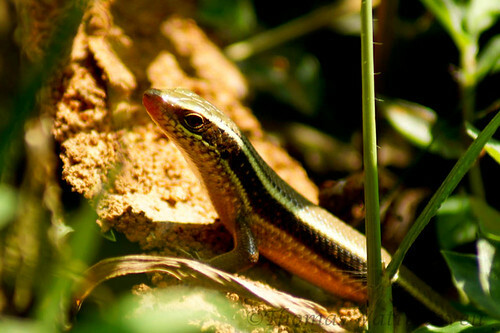 The skinks are carnivorous and feed mainly on insects, earthworms and slugs. 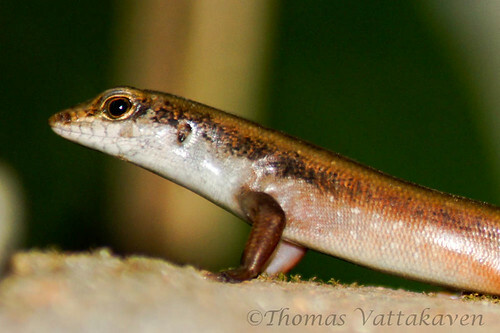 These skinks prefer to live under logs and stones or amidst leaves and twigs. They are active by day and frequent water sources and other areas frequented by insects. 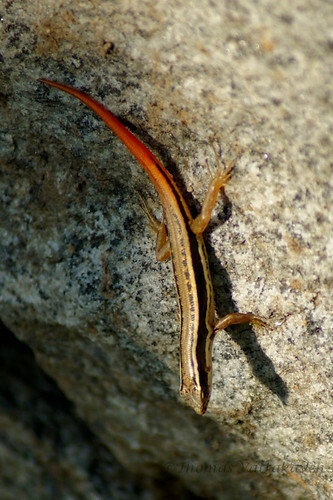 Skinks include , egg laying, live bearing and a mix of the two (ovoviviparous) types of birth. As far as I am aware this species are oviparous (egg laying). The skinks are often kept as pets and they may get used to a more vegetarian diet. However in nature they are voracious predators and on hot days can be very active stalking and munching on their insect prey or fighting among themselves. 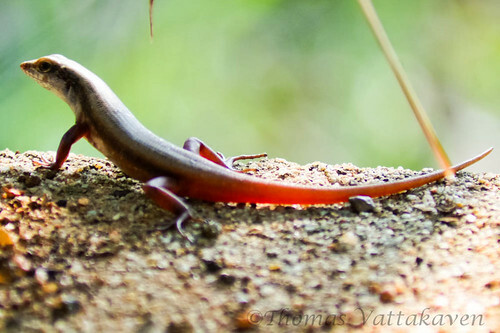 To get these images of the Dussumier’s skinks I waited for and hot and humid morning when the sun was shining enough to warm the blood of these cold blooded creatures and make them active. There were more than enough candidates on view and it was just a matter of picking and choosing which ones to photograph, however most of the lizards were small, immature ones (above and below) of around 10 cm long and I had to wait a while before finding a big one (4th image) which was about a foot long from head to tail (a forest skink). That fellow, however didn’t hang around for too long. I used a 70-300mm Minolta lens with my Sony A500 camera. The lighting alternated between shady to bright sunlight and I employed a Minolta 3600D flash on the camera when needed. I had to get close enough to get smooth bokehs but these lizards were not as tolerant as the garden lizard and that made things a little harder. 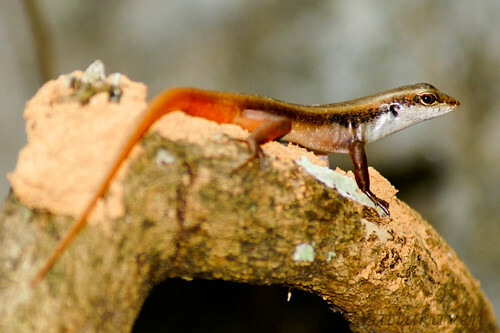 The species featured here seem to include the Dussumier’s forest skink as well as the Dussumier’s litter skink. Thanks to Shawn from Creatures of the Wild for pointing that out for me. 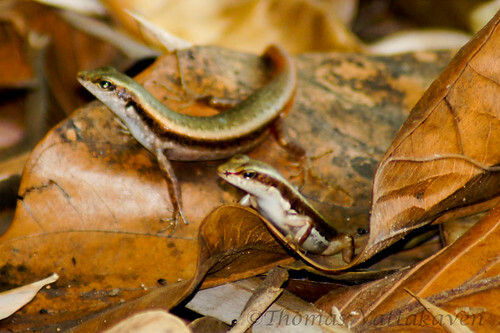 The 3rd 4th and 5th images appear to be of the forest skink, while all the rest, sporting a red tail appear to be litter skinks. Thanks Shawn. A very nice collection of skinks indeed. I don't think all the skinks here are the same. 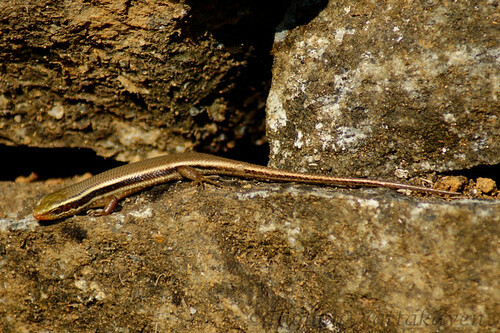 The skink in the 5th picture is a Dussemier's Litter Skink, that's for sure. I've also seen many of those in my home in India. I once had to rescue one that fell into the pond. Great shots by the way. Thanks Shawn, I`ve changed the text to correct that. Its good to have a reptile expert to point out the details. No Problem, Tom. By the way, are you a malayalee? I am. Very much, I am from Thodupuzha, where are u originally from? 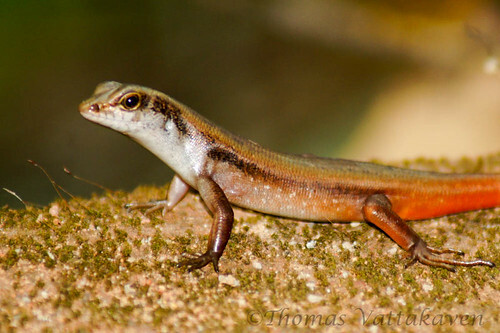 I've seen a lizard that looks a lot like the Dussumier's litter skink around Bangalore, in urban areas. 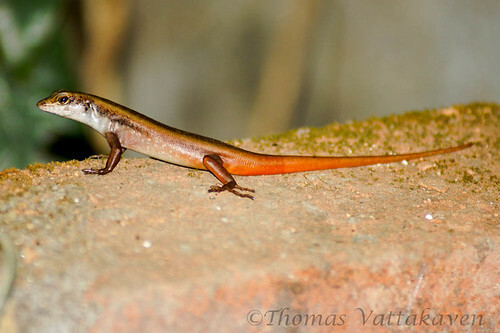 Is the litter skink found only in the Western Ghats?